For those with contemporary living spaces, finding a suitable fire is essential. One that will not only meet your heating needs but also be aesthetically pleasing and appropriate for your home’s style and decor. Dovre’s broad range of contemporary wood burning stoves and fires includes the Astroline. This solid fuel stove range comes in a choice of six sizes with some models offering additional options such as plinths and wood stores. The range offers an efficiency rating of up to 81% with equally impressive heat outputs between 6 and 10kW. 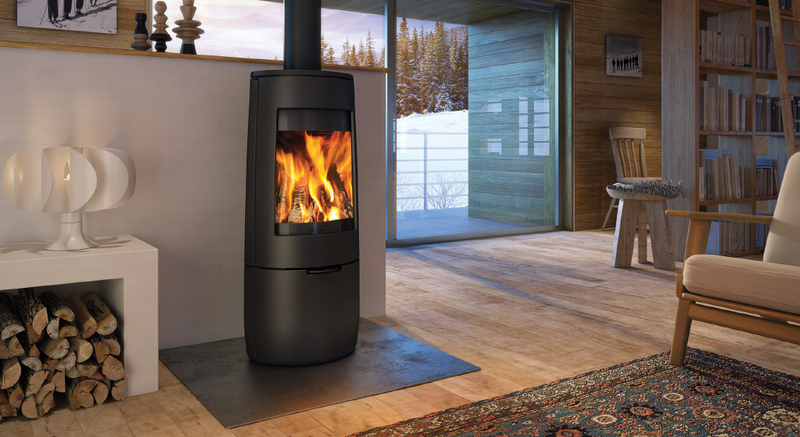 Despite streamlined proportions, the Dovre 1CB contemporary wood burning stove, as shown, can still accommodate logs up to 37.5cm in length which ensures less frequent loading and a powerful heat output. Its tall firebox allows for wood to be loaded in a wigwam shape; giving you an impressive flame picture as well as effective warmth for your home. Each stove in the Astroline range is made from cast iron. This is a highly regarded material in the wood burning stove industry due to its heat diffusing properties that allow for warmth to be released slowly for a consistent output and comfortable, ambient warmth. All contemporary wood burning stoves in the Astroline range offer advanced firebox technology with airwash and cleanburn features. These work to both keep the glass in your stove’s door clear of soot deposits and particles, as well as ensure the optimum burning conditions for efficient use of your fuel. For further advice about contemporary wood burning stoves, visit your local Dovre retailer for expert advice.